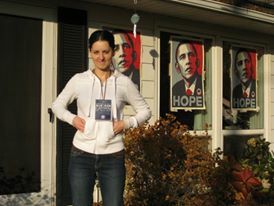 The last time I was in the U.S. during a presidential election—2008—I got myself right on the front lines, moving to Ohio to volunteer for the Obama campaign and watching each twist and turn of the campaign with breathless excitement. By the time the 2012 election rolled around, I was living in Botswana with my husband and baby and couldn’t even stay up late enough to watch the returns come in, so I didn’t find out who the winner was until morning. I cared just as much, but living abroad I was too far away to do anything besides cast my vote in the mail. Watching your home country’s elections from overseas can stir up a lot of feelings, especially if your preferred candidate isn’t doing so well. Here are the seven stages of grieving for the expat voter, explained, to get you through that difficult period when you’d like to fly home and beat some sense into your fellow Americans. 1. Shock. Perhaps you were paying too much attention to the internal politics of your new country or were busy watching rugby or cricket or whichever non-American sport you’ve started to follow now that you live overseas. Whatever the case, you looked up one day to discover that the most popular candidates for president weren’t the ones you’d hoped or predicted, and you can’t believe your eyes. Surely America will come to its senses, you think, and pick the leader you believe the country deserves.